If you haven't read the introduction the great deck design tips, go there before reading these tips. It'll make more sense that way. If you've already read that... here you go! I mentioned this earlier, but it is worth repeating. Don't think of your project as a deck, or as something just added to your house. Think of it as an extension of your living space. How do you live? Is cooking a significant part of your lifestyle? Or might it become so outside? Do you entertain? Do you gather with a bunch of friends to watch a game? Or would you be more likely to have just a couple of friends over to relax and enjoy good conversation? Maybe you will only use the deck for your family. Will you need space for tables and chairs? Weigh these things out and make sure your deck design fits your lifestyle. Consider your climate and whether you're likely to use your outdoor space in cool weather. Should you plan for an outdoor heater or a fire feature? What about a water feature? 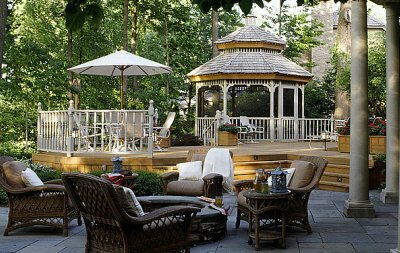 Your lifestyle and the way you interact with your friends will determine what you need in your outdoor space, including your deck. Could you blend in different materials to make your deck design more unique, more interesting? How about brick or stone support columns? If you will be adding a fire or water feature, what will it be made of? Contrasting styles, colors, and materials add interest. Don't get too carried away - it's easy to get too much of a good thing. A popular way to create interest is to use a different material for your deck railing. A redwood deck with aluminum railing can be stunning. How about glass railing on a composite deck? Even the use of one material for the railing posts and another for the rails and pickets can create a beautiful and distinctive look. Maybe you can use brick support columns that continue above the deck level to serve as railing posts. Don't forget to consider the materials used on the exterior of your house. Try to continue those materials and colors onto your deck. Remember, your objective is to extend your living space into the outdoors, so you should also extend the house design into that new space. You have a number of choices when it comes to building materials for your deck. Some of them are very low maintenance. That's the good news. The not so good news is that the cheapest material is also the highest maintenance. 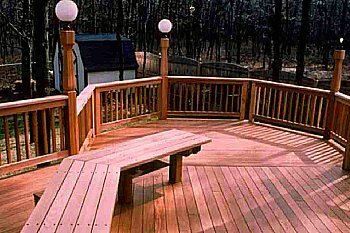 Treated pine is by far the most common material for deck building. More exotic woods like redwood and ipe require much less maintenance and last longer. Composite decking material requires even less maintenance. These materials cost more than treated pine, but they benefits are often worth the extra cost. The budget decisions are up to you. Will you want to use your deck if it's raining? How about when the temperature gets well into the 90's? 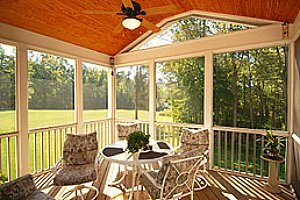 Depending upon how you plan to use your deck, you may want to consider adding a covering over it. If you just want to block some of the sun, consider a pergola. It's no help with the rain, but it can provide limited shade and can keep the temperature down a few degrees. A full covering will allow you to remain outside in bad weather. It's usually best not to cover your entire deck, because there are times when you'll want the sun. If you don't want to have a structural cover built, you may want to check out a vinyl awning. Awnings can be permanently fixed, using an aluminum frame, or they can be retractable. a retractable awning gives you the option of full sun or full covering, depending on the conditions and your needs. GREAT DECK DESIGN TIPS - #5 How About Hiding Your Fasteners? There are a variety of ways to hold the various pieces of your deck together. Obviously there are nails, screws, and bolts. Nails are less expensive, but also tend to work loose over time. If you do use nails in wood, make sure they are ring shank nails. These nails have serrated edges that grip the wood and make it less likely they will loosen. But when wood cures, it sometimes twists, and can exert tremendous pressure on fasteners. Screws are more secure than nails, but they also cost more and take longer to install, so labor is usually a little higher as well. In my opinion, that is money well spent. Some types of screws are designed to hide themselves when used in composite material. The composite material actually closes in over the screw head as it is screwed into the material. Sometimes a gentle tap with a smooth faced hammer is needed to get the material smoothed out over the screw head. Hidden deck fasteners are a step up from standard nails or screws. There are various styles, but most involve a metal piece with tabs that is screwed to the top of the joist, and slots that are cut into the side of the deck boards. The tabs fit into the slots in order to hold the board down. when the next board is installed, it covers the metal piece for an invisible fastening system. Again, the cost goes up, both in materials and in labor. 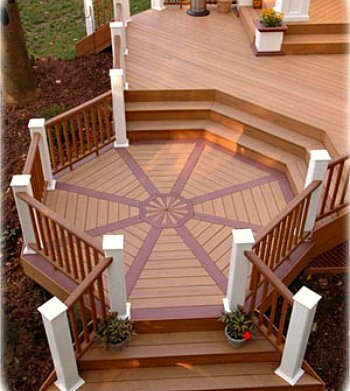 This type of system is typically only used with composite or aluminum decking.